In his recent exhibition at the Goethe Institut, Gavin O’Curry employed music and melancholy to hint at a sadness in the heart of the American dream. Dreams bring darkness as well as light, and this dichotomy of light and shade is played out in the depressed radiance of O’Curry’s small paintings and single sculpture. With the painting Crucifixion, O’Curry’s reflections on “loss and broken dreams”  employ a central image resonant with several layers of iconic hope and foreboding. 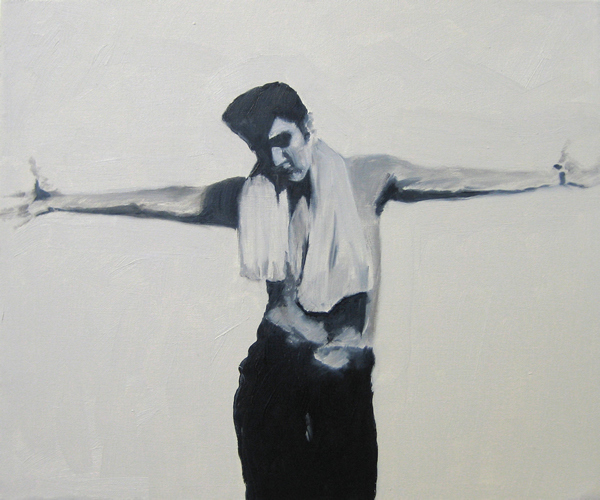 The tiny painting contains a blurry Elvis, bare-chested, with arms outstretched to the edges of the canvas, a figure at once “provocative and vulnerable” , poised like a shorn Samson between the twin pillars of the Goethe’s chapel-like return. Taken from an early record cover, the image shows Elvis at the apogee of success in a pose foreshadowing disasters to come. The disparity between reproduced images and the physicality of paintings is a gap O’Curry seems interested in. Newspaper supplements, the TV screen, and his own casual photographs provide original scenes, primary images to be translated into paint. The German artist Eberhard Havekost has exploited similar sources to make deadpan paintings of harshly lit figures and mundane urban settings. O’Curry’s paintings are less easy to pin down; they are a curious assembly of the banal and the charged, achieving their effects with painting that combines shorthand techniques with a closer feeling for the paint itself. In the room downstairs the cheery monikers continue with The Lost American, a painting with an unlikely-looking John Wayne appearing to melt into the surrounding desert heat. O’Curry positions his works precisely. His lonesome cowboy peers out to an imaginary horizon, directed by a landscape of wispy paint strokes towards the next painting along the wall. This is a curious, scotoma-like rectangle, its mute surface barely concealing some hidden illumination. The title,Black sun, suggests blindness from an excess of light. The tone may be gloomy, but O’Curry’s fallen idols are too composed for real despair; they share a closer kinship with Raphael’s cool martyrs than with Holbein’s wrecked cadaver. The small canvas After Millet is based on a press photograph. It depicts the aftermath of a recent atrocity and infuses it with a soft raking light reminiscent of the pastoral scenes of the nineteenth century French painter. 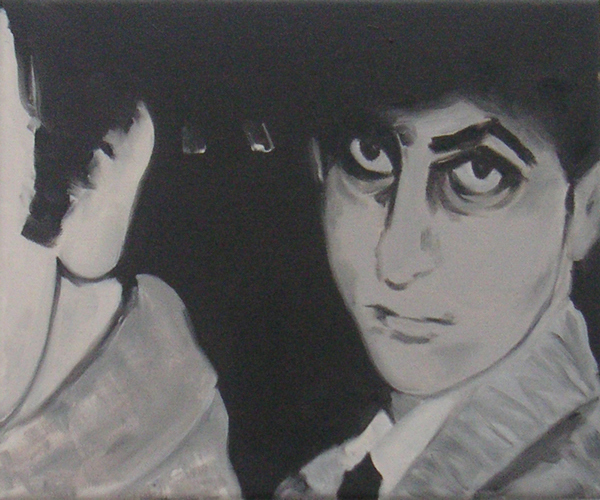 The rapidly made surfaces and grey tones of the Goethe show bear comparison with the Polish painter Wilhelm Sasnal. Both artists use photography and images appropriated from news media and popular culture to expose a subtle anxiety at the heart of familiar scenarios. 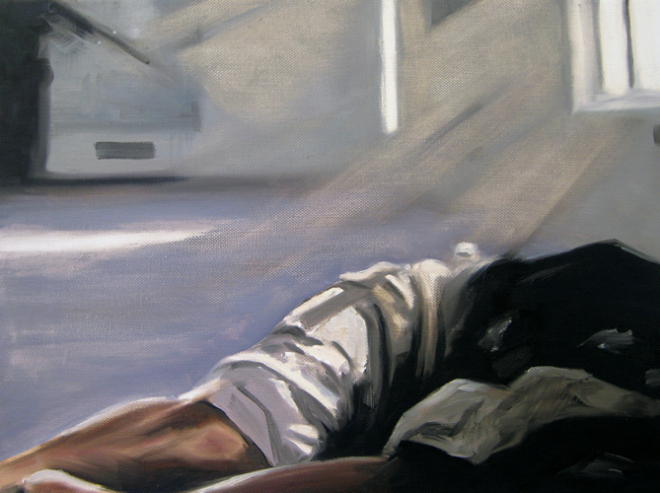 You sense that O’Curry looks at his paintings for a long time without doing anything to them. The finished surface, the work of a couple of hours perhaps, appears all at once, like a desaturated Alex Katz painting, or a darkroom photograph coming to light. The artist’s distinctive approach is complicated further by occasional sculptures. These works refer back to a minimalist aesthetic and unabashedly exploit the theatrics inherent in their reduced forms. Usually made in relation to a specific space and exhibition, they form a dialogue with both the space itself and the paintings within it. Returning to the ‘chapel’ upstairs, a brighter mood is revealed with O’Curry’s acrylic sculpture, Beginning to see the light. The air-blown bowl of black plastic is an inverted image of the room’s oval skylight. 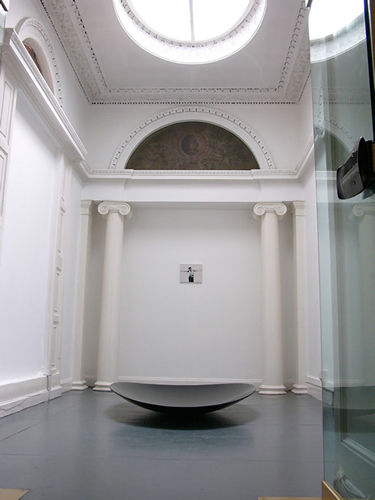 The reflective surface of the black dish (a giant cornea resting lightly on the floor) directs the eye upwards, beyond the confined spaces of the exhibition, to its equivalent form in the transparent skylight overhead. Baby, I’m beginning to see the light. In 1955 guitar player Thomas Durden, inspired by a suicide story in the Miami Herald, wrote his first (and only) hit. Durden had read abouta well-dressed man who destroyed his identity papers before destroying himself, leaving only a note that read, “I walk a lonely street.” He put a hotel at the end of Lonely Streetand convinced Elvis Presley to record his new song. A 1956 television performance of a swaggering Elvis singingHeartbreak Hotel before an audience of screaming girls suggests he wouldn’t be lonely for very long. From curator Jonathan Carroll’s press release for the exhibition. 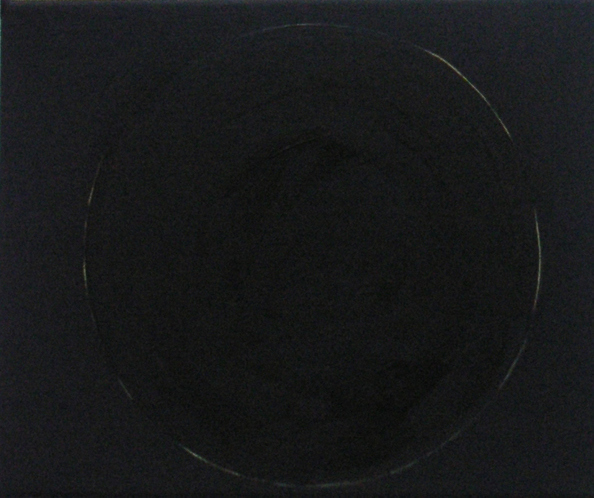 It reminded me of Julia Kristeva’s book, Black sun, and her description of its title (taken from a Gerard de Nerval poem) as “a dazzling metaphor,” an imagined sun that is “bright and black at the same time.”  Darkness is the necessary converse of light. Kristeva’s meditations on melancholia include a chapter on Hans Holbein’s stark painting, The Dead Christ in the tomb stop where she argues that depictions of seeming hopelessness can also contain a promise of redemption. Despite these dark reflections, my feeling is that the paintings themselves, with their off-hand facility, are not cut out to carry the weight of the associations they muster. Paintings from the past are an important touchstone for O’Curry, and in conversation he will refer to Millet or Vermeer as readily as more contemporary sources. Sasnal himself has made a series of paintings entitledGraceland; paintings shown at Hauser & Wirth, Zurich, 2007.